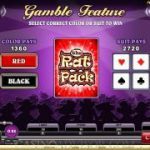 The Rat Pack, as its name suggest, is a video slot game from Microgaming that uses rats as symbols in this game. This is actually a game that is dedicated to some of the best singers ever, Frank Sinatra, Sammy Davis Jr. and Dean Martin, the former members of the very popular Rat Pack. Since the theme of the game is unusual we would expect also a feature that is slightly different from what we are used to see, and there is one. But first, let`s start with the special symbols. We have a wild which substitutes for every symbol except for the multiplier symbol and the scatter to complete a winning combination. Then we have the 2x which also acts as a wild and substitutes for every symbol except for the scatter, and every time it completes a win it doubles it too. The gold disc is the scatter and if you land at least 3 symbols you receive a random number of free spins. This is also an important symbol which will determine the length of the feature. The gold disc awards you with 1 free spin and it remains in place for that spin. The symbol nudges down with every next spin until it disappears. 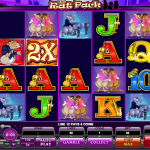 The Rat Pack is definitely an interesting slot and for that reason it attracts many punters. The theme is unique and there are special features that are everything but boring. This is something we do not see very often and if you manage to trigger the special feature you will like to see as many gold discs on the reels as possible. Try the game and you will love it for sure. 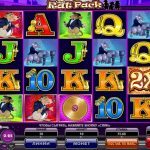 Racing and money go well together and Supe it Up a 5 reel slot by MicroGaming, is another great example!